XS sights perform brilliantly in the Arizona dusk. Ed Stock works on his presentation from the holster with his XS-equipped SIG 226. Few will dispute the importance of both speed and accuracy in any defensive use of a firearm. While accuracy will always be paramount, to ignore speed would be, well, fatal. I once read a very interesting study in which the author posed and defended the hypothesis that the person who lands the first solid hit in a gunfight will likely be the winner. Well, duh--I could have saved him a lot of time and effort as this, in my opinion, would fall within the realm of common sense. Yes, I know that common sense is not all that common, and just because one lands the first solid hit does not mean that he, too, will not get shot, thus ending up a "loser." But as a general rule, the first accurate hit in an armed confrontation is something worth working toward. All defensive firearms fundamentals, techniques, tactics and mindset training comes down to putting ourselves into a position so that we get the first solid hit. Recently, I had the pleasure of spending time with two companies within the firearms arena that have dedicated themselves to offering products that will help good guys get this first-shot advantage. XS Sight Systems offers the Express fast-acquisition sight system for handguns and long guns. Comprising a large-dot front sight and a shallow V-notch rear, the XS sight is one of the fastest-on-target sight systems ever developed. The other company is Gunsite Academy, known in the past as the American Pistol Institute, which was founded by the legendary Lt. Col. Jeff Cooper in 1977. What started out as one square range with a trailer as a classroom is now the foremost public training facility in the world. These two companies got together and invited a few writers to go through a two-day training course in an effort to display just how well they complement one another. Throw in a little Surefire flashlight training on the evening in between, and the result was a fast, but solid, information "dump" on all who attended. XS 24/7 sights come in both large- and small-dot configurations. It is not unusual for manufacturers to put on informational seminars for writers when they introduce new products, but it is quite unusual for a manufacturer to display its product in the environment for which it was designed, yet that is what XS Sights does when it brings writers to Gunsite. Calling it a "Writer Roundtable," it is essentially Gunsite instructors putting the writers through a small sliver of the course instruction that Gunsite offers. The only caveat is that all guns used during the roundtable are to be equipped with one of the many sights offered by XS. This was the fourth year for the event; the last three have also been held at Gunsite. All have been spearheaded by long-time Gunsite instructor Giles Stock. Giles is a retired Phoenix, Arizona, police sergeant who has been with Gunsite since 1981. Prior to his retirement, Giles was the primary firearms instructor for Phoenix PD as well as the armorer supervisor for its SWAT team. Helping Giles with this year's roundtable was his brother, Ed, who has the distinction of being Gunsite's longest-serving instructor, having continually been on the staff since 1980. Ed is still serving with the Arizona Department of Public Safety as the senior explosives-disposal officer and SWAT-team member. Additionally, Ed recently returned from a six-month stint in Baghdad, where he was involved in security operations. His stories of what went on and what gear/tactics work and do not work could have filled the two-day period. Each of the writers received individual instruction where needed. Here Giles Stock works with Dave Douglas on his trigger control. Dave Biggers is the new law enforcement sales manager as well as the PR guy for XS Sights, so he headed up the XS contingent for the roundtable. He brought along chief gunsmith/custom-applications guru Bo Wallace in the event that any technical problems or questions developed. Both of the XS guys went through the entire program with the writers. The first day began with a greeting from the new Gunsite owner, Owen "Buz" Mills. 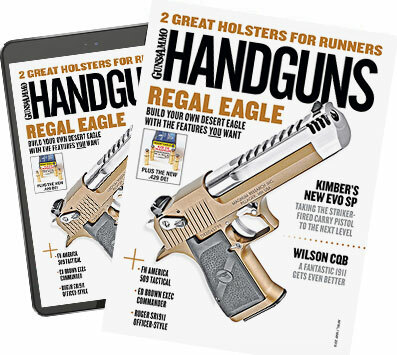 Mills is singularly responsible for returning Gunsite to its top-rung level of prominence in the firearms-training community by buying the school and then investing a great deal of money into it. I was at Gunsite a number of years ago, when it was being run by a previous owner, and I was concerned that the facility would not last another year. The last few times I have been there, however, I could not help being impressed with the improvements that have been made. XS also makes rifle sights like those on this Springfield M1A. Gunsite currently has seven square ranges that are supplemented by numerous range-like facilities that are used for specific training purposes. For those who have been there, I am speaking of the Donga and Scrambler, just to name a few. For those who have not been there, these are areas within the facility that, due to their topography, allow the Gunsite staff to put the student through a few challenging courses of fire. Other areas, like the 727 simulator and the North American and African ranges, are facilities set up to meet specific training needs. Gunsite also offers three live-fire training houses, what are call "simulators," that will meet the needs of most any enduser. Whether you are a clerk wanting to learn how to protect your mom-and-pop grocery or a Navy SEAL working your way down the center of a ship, one of these live-fire houses will simulate the environment in which you will operate. roduced his brother, Ed, as well as the folks from XS Sights, and the day began. Dave Biggers emphasized to the group that XS Sight Systems feels that the Express handgun sight system is the finest sight made for fast sight acquisition in all light conditions. While XS still makes plain white-dot sights for some models, everyone in the group had a handgun that was equipped with one of the 24/7 tritium-insert sights. Glock and 1911 variations made up the bulk of the firearms in the group, with Ed and Wiley Clapp carrying the lone SIG-Sauer pistols. The author engages the charging bad guy from the holster after taking a lateral step. Anyone who thinks that you must carry only a 1911-style .45 at Gunsite is sorely mistaken. I had the pleasure of talking with a number of the Gunsite instructors who were on site (there were a lot; the school was playing host to the 10th Special Forces Group, two carbine courses and a pistol course along with our group), and while a number of them were carrying 1911s, I also saw a number of them with Glocks strapped to their sides. Giles mentioned that the school wants students and instructors alike to carry what they are comfortable with. It should be noted, however, that a bottom threshold of .38 Special/9mm is strongly recommended. This sounds reasonable. Wiley Clapp works his way through one of the simulators. The XS handgun sight system does take a bit of time to get used to as it does not offer the classic "square post in a square notch" sight picture offered by other sights. To line up XS sights, the shooter needs to place the large front dot in the center of the shallow V rear notch. When this is done correctly, the large white dot will sit on top of a white line in the center of the notch. XS calls this "dotting the 'i'" while I prefer to think of it as making a lollipop. Whichever visual representation you wish to use does not matter as long as the job gets done. The 24/7 sight has the advantage of having a white front dot with a green tritium dot in the middle, and the rear white line has a green line in the center. I find the combination of the black, white and green sight easier to acquire than a plain white sight. At close range (15 yards and in) the front dot goes on top of where you want to shoot. At farther distances, rounds will hit at the top of the sight dot. In timed exercises I have found that the XS-sight dot is quicker to get on target than a traditional post front sight. From seven yards, using an 8x10-inch steel plate, I have found that the XS sight is .19 second faster, on the average, than a traditional set of three-dot pistol sights. While some may argue that this is insignificant, it is a measurable difference and something to consider. I think this is due to the fact that the XS sight picture is acquired by placing the large front sight on top of the rear vs. trying to find the front sight through the notch of the rear. The Scrambler requires the shooter to run from point to point and shoot from a variety of positions--certainly a challenge. Some argue that XS sights are not as precise when shooting small targets due to their lack of a sight "window"; however, it is this same lack of a precise window that allows the shooter to get the gun on target fast, find the sight and get the solid hit needed to end hostilities and save your skin. It's up to each of us to decide just how much "precision" is needed to prevail in the confrontational environment and at the distances we are likely to face. It was this first-shot speed that was emphasized to each of us as Giles and Ed took us out to the range. The first half of the day was spent at distances from three to 50 yards getting hits to vital areas of the target. These drills were done from both ready and the holster as well as while moving. The XS sight is quite capable of good hits out past 50 yards, with everyone in the group making hits out to this distance. The second half of the day was spent working with XS sights mounted to various shotguns, carbines and rifles. Both close-quarter and long shots were made with the group looking at the advantages and disadvantages of the XS dot sights vs. the newer 24/7 Tritium Stripe post-style sight. After dinner, the group returned to the range for a bit of reduced-light shooting. Each of the participants had been given a Surefire G2Z combat light made from space-age nitrolon polymer. Giles feels that this is one of the best lights made by Surefire due to its shock-resistant construction, light weight, bright white-light output and low cost. The design of the flashlight permits the use of the Surefire/Rogers flashlight technique (also known as the syringe technique) as well as others. A lanyard is supplied with each light that can be placed around the wrist so that the flashlight is not lost while reloading, opening a door or other function required of the nonshooting hand. With a light output of 65 lumens and a white-light beam with no "dead spot" in the center, a Surefire G2Z combat light is as essential to personal defense as gun and holster. The remainder of the evening was spent working with the tritium 24/7 sights in combination with the Surefire flashlight from various positions and distances. Emphasis was placed on getting the hands into a stable flashlight shooting position from the holster without crossing the support hand and arm with the muzzle of the gun. Of course, keeping your finger off the trigger until the sights are on target will go a long way toward not shooting yourself when working with gun and flashlight. Realizing that a rifle will always be better than a handgun, the author ran the Scrambler with a Colt carbine under the watchful eye of Giles Stock. ios, emphasis was placed on proper weapon control, search techniques, use of cover and concealment, room clearing and--yes--getting on target fast for the first accurate shot. It is always interesting to see how differently people perform when they are being shot at vs. engaging a paper target. The flinch factor of trying to pull back away from incoming fire is immense and can be reduced considerably if the shooter would just slow down, move carefully and not expose any part of his body not needed to get the job done. Most people are "killed" in force-on-force training because they go way too fast, trying to dynamically enter rooms and pie corners instead of being methodical. Very few defensive situations require the speed of a SWAT operation or hostage rescue, but many equate speed and "cool" tactical movements with competence. One of the more interesting drills of the event was shooting at one of the Gunsite robots. Anyone who is familiar with what really happens in gunfights realizes that they are not static affairs but situations in which most all of the "participants" are moving. Charging and lateral target systems are certainly a step up from stationary targets, but the robots used at Gunsite can move in a fashion similar to real people and at a speed that closely mimics human movement. Shooting at these robots from the holster was both a challenging and worthwhile experience. A company that will allow a group of writers to evaluate its product in an environment like that supplied by Gunsite is very sure of the quality of its product. Throughout the stress provided by the Simunitions being shot at me, moving robot targets, building search scenarios and shooting-on-the-move drills, I had no problem getting my eyes on the front sight of any of the guns I used. In reality, XS sights are hard to ignore. At the same time, Surefire lights are a must-have, and Gunsite training is the best available. XS Sights, Surefire and Gunsite--it doesn't get much better than this.